Linda Newbery's own contributions to suffragette fiction for young readers are GIRLS FOR THE VOTE, published by Usborne, and UNTIL WE WIN, Barrington Stoke. Perhaps it's surprising that there hasn't been more fiction set during the women's suffrage campaign - offering, as it does, strong roles for women with ample opportunity to show determination and physical courage and to defy expectations. The current centenary - 100 years since the Representation of the People Act granted the vote to women of property-owning women of 30 and over - has seen new publications, but my first choice, Half of the Human Race by Anthony Quinn, first appeared in 2011. I've shown the original hardback jacket here, as the paperback goes for romantic appeal, not even showing the suffragette colours or drawing attention to the theme. I found this a really absorbing read, excellent on period detail and attitudes to women's roles, especially for ambitious women like main character Constance who wants to be a surgeon but whose family's limited finances are directed to her brother. She's poised to marry professional cricketer Will, but they fundamentally disagree over her campaigning activities and her refusal to promise to obey as part of her marriage vows. Constance goes to Holloway Prison and endures force-feeding but withdraws from the suffragette movement in horror when some of its more extreme supporters begin to use bombs, endangering life. Later, working as a wartime nurse, she goes beyond her role when she intervenes to save a life, at the risk of jeopardising her own career. Characters are strongly and sympathetically drawn, especially Andrew Tamberlain, a famed cricketer at the end of his career. A friend of Will's, he's introduced as a minor character but later becomes a significant ally to Constance, his fate interweaving with theirs in quite unexpected ways. By the end, accompanying them, you'll feel as if you've been on an epic journey. All three of these novels take us to prison and through the ordeal of force-feeding. In Ajay Close's A Petrol Scented Spring I almost felt I'd been through it myself, so graphic are her descriptions. In a Perth prison, Dr Edward Watson is one of the few doctors willing to force-feed hunger strikers. Such invasive brutality may seem the unlikeliest start to a seduction, but Dr Watson finds himself increasingly drawn to Arabella, the defiant woman he tortures daily; he engages her in conversation, fascinated by her implacable will. The narrative, moving back and forth in time, is shared between Arabella and Donella, Dr Watson's wife, who marries him in 1916 in ignorance of his prison activities. Ajay Close's writing is animated and assured, with occasional humour alongside the grittier details. In Jon Walters' Nevertheless She Persisted, Nancy doesn't shrink from detonating bombs. One of a pair of sisters, both sexually abused by their father, she takes up work at Holloway as a warden. But, fascinated by glamorous detainee Daisy Divine, an actress known as 'The Duchess', she's soon passing notes between prisoners and eventually finds herself on the wrong side of the cell door after adventures involving subterfuge, disguise, safe houses and the procurement of explosives. Sister Clara, meanwhile, ponders marriage to the too-conventional Ted at the cost of giving up a career in which her ability has been recognised. This novel stops short of the outbreak of war but leaves Nancy relishing the new freedom she's found in her activism and by dressing in men's clothes. Young adult fiction has seen some excellent new publications this year and last, plus a welcome reissue. 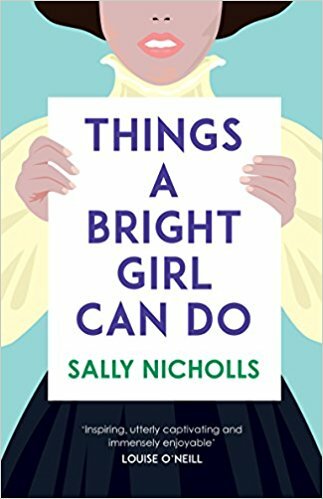 Sally Nicholls' Things a Bright Girl Can Do is a substantial novel interweaving the stories of three young women - Evelyn, May and Nell - and introducing a range of attitudes and class backgrounds. Most suffragette fiction centres on the WSPU, but here's a wider view that identifies the differences between the various organisations. Evelyn joins the WSPU while May, a Quaker and staunch pacifist, favours the East London Federation of suffragettes, Sylvia Pankhurst's campaign against sweatshops and for fair conditions for working women as well as for the vote. Her new friend / lover Nell, from a poorer background, takes up work in a munitions factory for reasons May fails to understand: Nell is trying to support her large family. We follow all three characters through the war and beyond, to the point where new opportunities open up for them. 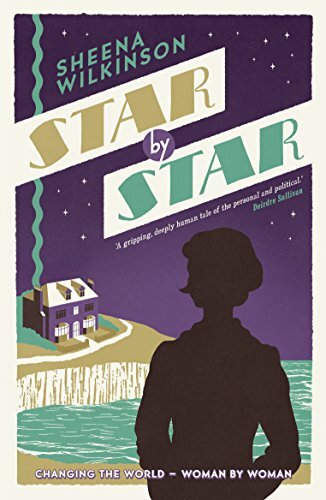 Sheena Wilkinson's Star by Star is set in Ireland in 1918, but sweeps both back to the war and forward to the new opportunities opening up for capable young women like Stella. Daughter of a campaigner who died in the flu epidemic that follows the war, she's excited by the forthcoming election and determined that no one eligible should miss their chance to vote. Sent to Ulster to live and work at her aunt's boarding house, she befriends a stricken army Captain - thus Wilkinson deftly takes the reader back to the war years - and makes a discovery about the father she's never known. Readers will strongly identify with the resourceful, well-intentioned Stella and with the practical and moral dilemmas she faces, and will hope that she finds a role to suit her talents. 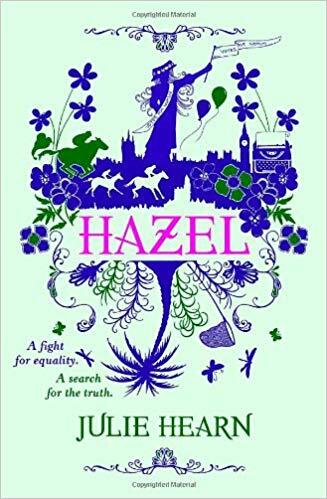 Julie Hearn writes with freshness and vivacity in Hazel, one of three novels that form an attractive family saga over three generations (though each can be read alone). The dashingly-named Hazel Mull-Dare is the daughter of Ivy, the pre-Raphaelite beauty and painter's model who was titular heroine of the previous book. Here we start with the dramatic death of Emily Wilding Davison in a novel that looks at various manifestations of power, privilege and emancipation. Teenage fiction as involving and immediate as these three captivating novels will leave young readers in no doubt of the importance of voting as soon as they're of age - even if current political upheavals haven't already convinced them of that. 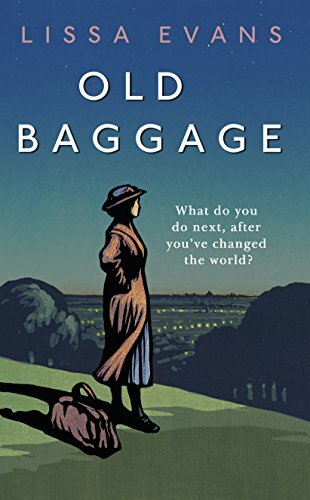 Finally, here's one for my ever-increasing reading pile: Old Baggage, set in 1928 when the vote was extended to all women but looking back to the suffragette years. It's by the versatile Lissa Evans, who was shortlisted for the Carnegie Medal this year with her children's book Wed Wabbit. If anyone's read it, do please leave comments below - also on any other suffragette fiction you'd like to recommend. 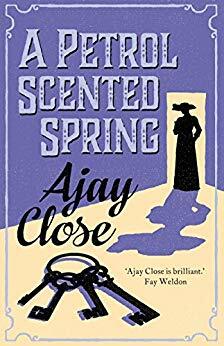 A Petrol Scented Spring is published by Sandstone Press. Half of the Human Race is published by Vintage. 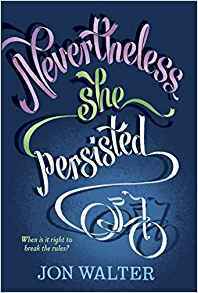 Nevertheless She Persisted is published by David Fickling Books. Old Baggage is published by Doubleday. Hazel is published by Oxford University Press. Star by Star is published by Little Island. Things a Bright Girl Can Do is published by Andersen.